Science packs put into the front lab will be passed to labs behind it. Labs are buildings that perform research for technologies by consuming science packs. 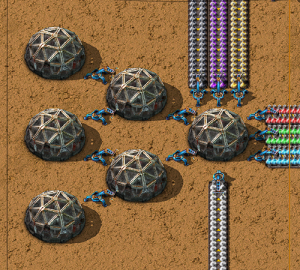 Use of a lab is required to progress in Factorio. The player can only research one technology at a time, but can use multiple labs for faster results. The speed bonus of labs when lab research speed is researched and modules are present can be calculated using this formula: research_bonus × module_bonus = speed_bonus; the percentage bonuses have to be converted to decimals (e.g. +140% = 2.4) before the formula is used. ERS is "effective lab research speed"
ACT is "adjusted cycle time"
PPS is "packs per second"
N is the number of labs available. This means 0.8 science packs per second, of each type, would need to be produced to continuously supply the labs. The research speed of a lab is now not dependent on its electricity consumption, and can be scripted. Lab research is now continuous; Science packs now have progress bars. Labs are now named after early access backers when built from blueprints. Changed the recipe of Lab to require 4 transport belts, down from 5. Contents of the Lab is now shown in the entity info. This page was last edited on 2 September 2018, at 08:31.